The Denver Fire Department Foundation was founded in 2007 by Josh Hanfling and a group of other dedicated business and community leaders. At the center of our collective commitment is our desire to give our firefighters a better chance of returning home to their families at the end of the day. We are also dedicated to public safety and to ensuring that each one of us and our loved ones will be more likely to survive a life-threatening fire. In August 2007, the Denver Fire Department Foundation hosted a kickoff awareness and fundraising event where we screened Into the Fire, a film that powerfully shows the courage and sacrifice of firefighters across the country. Mayor Hickenlooper introduced the film, and more than 400 people filled the Wells Fargo Theater for the event. Showing the importance of our cause to the Denver community, attendees and sponsors graciously donated more than $32,000 to support our mission. Much of the evening’s focus was upon the unmet needs of Denver firefighters in the area of wellness. Heart attacks are the leading killers of men and women in the fire service. Event sponsor Fireman’s Fund insurance had already contributed $50,000 towards heart scans for Denver firefighters— scans that led at least two firefighters to emergency surgery to correct conditions that otherwise would have killed them. The extreme exertion of firefighting, coupled with the stress of the job and exposure to smoke and environmental hazards put firefighters at particular risk for heart disease and cardiopulmonary problems. 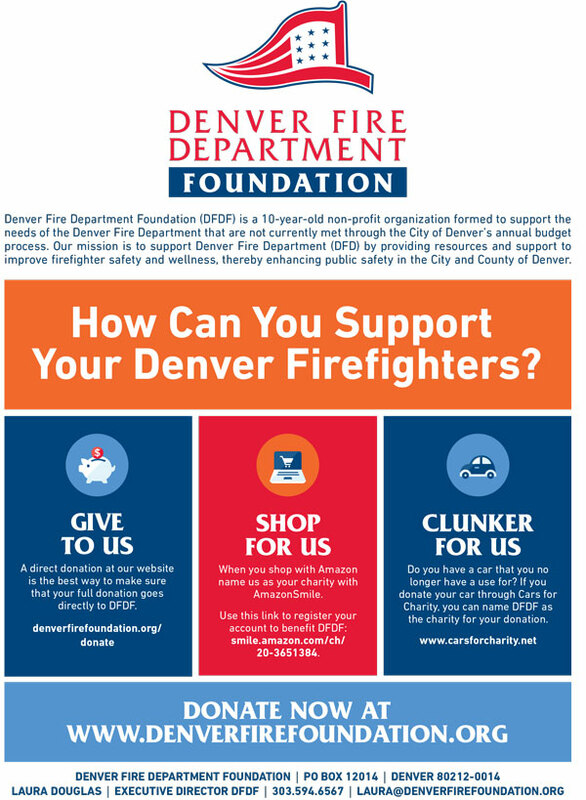 Since that time we have expanded our efforts to support the Denver Fire Department through public education, efforts to improve firefighter quality of life, enhance firefighter safety, and direct resources to meet firefighter needs thereby improving public safety in the City and County of Denver. BOARD OF DIRECTORS — Meet the folks who make it all happen. SPONSORS — We couldn't exist without the support of our wonderful sponsors.